The title says everything: SeekingArrangement.com is an online dating site whose goal is to introduce wealthy older men to young women with a taste for luxury, and ease their way into a mutually beneficial relationship without unnecessary hurdles and social courting. Seeking Arrangement prides itself on the fact that you won’t have to read between the lines, since both parties clearly state their expectations on their profiles. A satisfying relationship is guaranteed by the mutually beneficial arrangement made between the wealthy older Sugar Daddies seeking young hot Sugar Babies. The site strongly guards members’ privacy and intimacy by deploying a security gauntlet and reviewing every single freshly created account. Sugar Daddies and Sugar Babies who pass the background verification further stand out of the crowd. Seeking Arrangement, also, also throws in some unique features, such as the catalog of gift preferences, so affluent men can win the heart of their muse right away. The registration is free, and even though the ability to send messages demands a premium membership, a fully completed profile rewards you with a popularity boost. Seeking Arrangement promises a swift signup, and they keep their word. Besides the basic account credentials, you only need to clarify your gender and standing as either a Sugar Daddy or Sugar Baby. The system even provides a brief explanation for those who are unfamiliar with these terms. After these brief steps, you are able to immediately access the full site, but keep in mind that this first step only covered 16% of completing your profile. As a special offer, reaching 100% completion within 24 hours rewards sugar lovers with a free attraction boost, not to mention this is a requirement to contact someone. As for the rest of the steps, Seeking Arrangement puts a larger emphasis on personal details, lifestyle, income, and wealth. Appearance and a personal description are displayed, as well, but these parts aren’t flashed out that clearly. A typical Sugar Baby profile on Seeking Arrangement allows for Sugar Daddies and Sugar Babies to send messages or start a chat session. However, before courting your next Sugar Daddy, you need to fulfill two conditions. First, your profile must be fully finished; otherwise the message bar remains inactive. The other requirement is to have a premium membership. There is one other way that would guarantee that all worthwhile Sugar Daddies notice you, and that’s none other than the Gift Wishlist. Sugar Babies have access to a huge catalog of luxurious items from the most renowned jewelry, shoes, bags, perfumes, and chocolates from which they can choose their favorites. This list is a more than subtle hint for Sugar Daddies to invest in, so that they can make a good impression. The overall approach of pricing and subscription is one of the biggest pains of Seeking Arrangement. Although interested parties are allowed to taste the forbidden fruit for free, actually swallowing it would cost you money. In other words: the registration is free, but to make contact you need a premium membership. Upgrading the free Sugar Baby profile, also, means that you can hide your online status and join a date. Still, the actual fees to do so are ridiculously high. Then again, Seeking Arrangement goes after a select audience of wealthy people, and besides their profile screening the subscription prices are their best method of staying exclusive for the happy few. As for actual numbers, one month of membership costs $69.95 per month, they charge $59.95 per month for three months ($179.85 in total), while choosing the semi-annual plan is $49.95 per month, which is billed in one easy payment of $299.75. 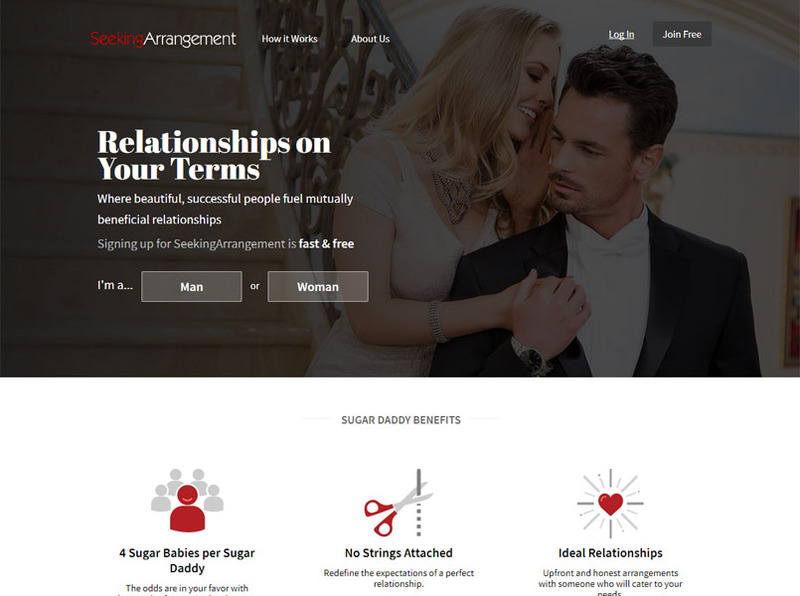 Seeking Arrangement adds an exotic flavor to its matchmaking by widely differentiating the profile structure for Sugar Daddies and Sugar Babies. In case a wealthy but lonely entrepreneur checks out the page of a cheerful young model, he can take note on the girl’s lifestyle expectation, showcasing the minimum amount of earnings needed to meet her interest. On the other end, young ladies see Prince Charming’s treasury level before getting better acquainted. The actual matchmaking is pretty inchoate. On the main page, three groups of recommended profiles appear (featured, new and background-checked), and for a more personalized results a manual search can be conducted with specific filters. The overly simplified approach is conspicuous at the design as well. The clear white background gives the site a clean and easy look, so that the profiles and their pictures stand out well. There is a FAQ page, where they preemptively answer the most common questions, and you are able to submit a ticket or report someone with a more pressing issue. What deserves the spotlight is the authentication and encryption system. Seeking Arrangement wishes to avoid the fate of Ashley Madison, thus they utilize an encryption system to protect the identity and personal data of their users. Furthermore, they closely inspect all freshly created accounts and constantly monitor the site for signs of abuse, cheating, and upfront money begging or any other unruly behavior. The site has a blog section with regular updates, and you can follow them on Facebook, Twitter, or watch their entries about the Sugar Baby University on YouTube. Seeking Arrangement started off with an interesting premise: what if you join a network where everyone can honestly state their intention without evasiveness and cheap lies? This part works well, as wealthy men and attractive women can agree on the exact limitations of their relationship without others shunning them. However, other than being an upfront “Sugar Daddy site”, Seeking Arrangement doesn’t bring much extra to the table. The design is very clean without bells and whistles to keep the focus on the profile pages with their pictures. The registration is quick and the profile menu promises a bonus upon quick completion, but it could still bear some extra customization options. The subscription fee is exceptionally high, though it would still not scratch the wallet of a real Sugar Daddy. The actual service you get from Seeking Arrangement for this amount of money is diminishingly low, though you are guaranteed to only encounter truthful and relevant profiles due to Seeking Arrangement’s thorough member screening. The site and its apps provide a straightforward and safe online environment without any fuss, and above all it stays true to its roots and its exclusive audience. However, there are many other sites that are 100% free for Sugar Babies, so it’s generally a good idea to join these first and save paying for sites once you know more.